Wangfujing is a dream shopping destination and by far one of the best and busiest shopping streets in the city. The place usually has a lot of pedestrian crowd and if you are looking for the perfect souvenir then this place is sure not to let you down. The street was first known as Morrison Street and was named after the Australian Journalist George Ernest Morrison. 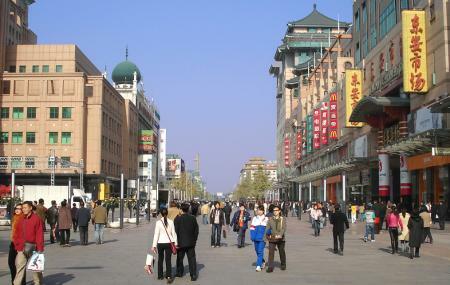 The shopping district is a home to around 280 famous Beijing brands. Take a bus from Sun Dong An Plaza. People normally club together Tiananmen Square and Jingshan Park while planning their visit to Wangfujing. A must see for all tourists, the combination of street food stalls and branded chain shops gives you a different taste of China. Try to catch the sunset by the clock tower and then explore the food stalls in the food market streets as the night begins. Lots of snacks and drinks along the streets. Definitely worthwhile at night with all the bright lights. The streets can get very crowded. This used to be one of the three famous shopping districts in Beijing. Although shopping malls have sprang up everywhere in the capital city of China it is still worth spending a couple of hours strolling along the now pedestrianised street whilst sampling the local delights of street food. If you are looking for the famous street food alley and shopping district, this is your subway stop. Make sure you map out beforehand exactly where it is, because it's easy to get turned around when trying to find the alley with the food stalls. Great place to stop for food and shopping. A world class subway route station.